Deciding where to eat out in the Canadian city of Vancouver is like asking a child to choose their favourite sweet treat in a shop full of sweet treats; they're all equally delicious in their own right and it's much better to educate the taste buds than to stick to the same flavours (in my view, anyway). 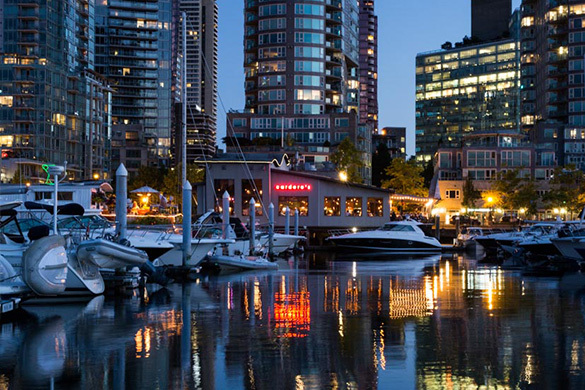 From hearty Canadian cuisine, sustainable seafood and upscale Italian dishes to casual Korean fare, American comfort food and delicate dim sum, Vancouver's food scene has something to satisfy every palate. My boyfriend and I spent 8 days eating our way around this wonderful city and here is a small (and by no means exhaustive) selection of the restaurants that we stumbled across on our travels. Priding itself on using fresh, local, high quality ingredients, Forage is one of Vancouver's pioneers of sustainable dining. With a menu designed to bring diners the best of British Columbia, choose from a carefully curated selection of dishes from land, soil and sea. Turtle Valley bison, duck confit rillette, Pacific halibut, award-winning seafood chowder and stinging nettle risotto are just a handful of the culinary pleasures you can choose from. As they say, sharing is caring so don't be shy and be sure to dig in to as many dishes as humanly possible! And don't forget to sample the delicious cocktails (the Unruly Sour is a firm favourite of mine). Thanks to its strong Asian influence, Vancouver is home to a magnitude of authentic ramen and dumpling houses. With an abundance of unassuming little eateries lining the streets of the West End, it's easy to forget that you're in Canada. So many so that Robson Street has now been lovingly renamed by the locals as Ramen Row. Dinesty Dumpling House serves a darling selection of dumplings, their most popular being their steamed soup dumplings. Choose from a variety of fillings including pork, shrimp and vegetables. Nothing fancy - just good, honest Asian food. So if you're looking for a light, tasty, inexpensive lunch, this is the spot for you. If there was one word to describe Timber, it would be 'Canadian' - there's no doubt about it. Paying homage to the history of the timber industry and the strong lumberjacks who single-handedly built British Columbia, Timber embodies a warm, welcoming Canadian home. If your idea of heaven is sitting with a local craft beer (or cocktail) in hand while becoming engrossed in the latest ice hockey game on the TV, simultaneously devouring a plate of Canadian comfort food surrounded by old friends and new friends, then Timber is where you belong. Dive into some good ol' poutine or nibble on fried Humboldt squid. Maybe a side of chicken wings are more your thing. And don't underestimate the (pulled pork if you're a meat-eater) mac and cheese. There really is no place like home! Now, this is not technically a restaurant but Whole Foods Market is definitely a place you should hit if you want to grab breakfast on-the-go or stock up on an unrivalled selection of healthy snacks. With everything you expect of an organic supermarket plus a hot food counter, salad bar, a wholesome bakery serving the most delicious and nutritious muffins (Power Muffins - you complete me) and a juice bar, it gives you all the tools to fuel that wonderful body of yours. One of the most magnificent parks in the world, Stanley Park boasts over 1000 acres of beauty. Spend a day cycling along the sea wall, appreciating the totem poles or pondering life at the beach - and when you're feeling peckish, conveniently located in the centre of the park is Stanley's Bar and Grill. With a menu bursting with hearty West Coast classics, you'll be spoilt for choice. West Coast seafood chowder, pumpkin ravioli, grilled sockeye, artisan salads and a variety of burgers take pride of plate, which can all be enjoyed in the serene surroundings of Stanley Pavilion. A popular seafood restaurant in a cosy harbour setting, Cardero's is the perfect place for a casual, uncomplicated and tasty meal. Fish is the highlight of their menu with mussels, oysters, prawns, shrimp, halibut, lingcod, sablefish, lobster and tuna making a star appearance. They also cater to those who prefer something less fishy, with steaks, pizzas and pasta also on offer. With live music every night, I would highly recommend reserving a table here as it can get positively packed to the brim (and it's much more enjoyable having your own table that being that person trying to eat a full three-course meal while sitting scrunched up at a bar). Tucked away down a little side street in Downtown Vancouver, Black Rice Izakaya is the ideal place to get your Japanese food fix. Serving a huge selection of sushi, Japanese tapas and great value bento boxes in a sophisticated setting, you'll wonder why you didn't visit here sooner. The food is delicious and reasonably priced, the service is faultless and the atmosphere has the perfect amount of 'buzz'. If you're not already a fan of Japanese cuisine, you will be your new favourite food after dining at Black Rice Izakaya. Located in the hipster district of Kitsilano, Oakwood Canadian Bistro serves wholeheartedly Canadian fare that is designed to be shared. With fine dining at its forefront, the menu comprises of smaller snacking plates, including scallop cracklings and ricotta polenta, to whet your appetite as well as an impressive selection of larger plates for an insatiable feast. Buttermilk fried confit lamb belly, miso and fennel pork belly, pan seared gnocchi with jalapeño honey butter and roasted mushroom spaghetti are only a sprinkling of the delectable dishes on offer that will surely have you roaring in delight. And don't forget to order a cocktail (or eight) from their extensive list; this is definitely the place to go all out. One of the cutest cafes in Gastown, The Birds and the Beets makes sitting down for a coffee or a bite to eat seem really special. There's something in the air here that simply makes life better. Maybe it's the freshly brewed coffee or the pretty floral display. Maybe it's the smell of the fresh bread that is baked onsite or the homemade granola. Or maybe it's the fact that the whole environment just feels nice to be in. Whatever draws you here, you'll be sure to have a truly lovely time. There's nothing like the true taste of Spanish tapas and thanks to España, you don't have to venture far from Downtown Vancouver to savour the Mediterranean. Andalusian olives, quality charcuterie, patatas bravas, grilled endive and mushrooms, artisan cheeses, snapper crudo, sautéed pork loin and grilled octopus are a few of the tempting tapas dishes carefully created to tickle your taste buds. Although unlike traditional tapas, España's portions are significantly more generous so if you're looking to sample a large portion of the menu, I'd recommend you take a friend (or several) - and be sure to end your feast on a high with some devilishly delightful churros dipped in rich, warm chocolate sauce.